At Twilight: a play for two actors, three musicians, one dancer, eight masks (and a donkey costume), Stephen Clyde and Adam Clifford playing Simon Starling and Graham Eatough, Holmwood House, Glasgow, August 2016. Photo: Alan Dimmick. Courtesy Simon Starling, The Modern Institute, Glasgow and The Common Guild, Glasgow. A Talk (2017) HD Video. Simon Starling’s new “talk work” devised specifically for TransARTation! 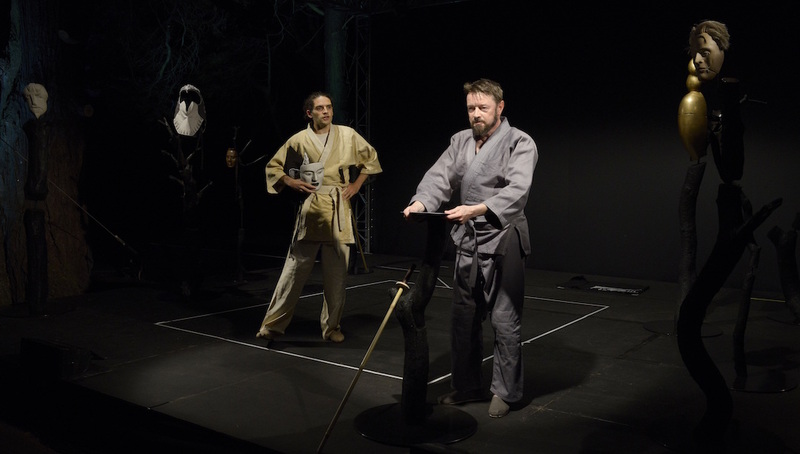 takes as its starting point an image of the Scottish actor Stephen Clyde standing at an improvised lecture podium while playing the role of the artist at the Glasgow debut of Starling’s 2016 play about the mistranslation and reinvention of Japanese Noh theatre in avant-garde Europe during World War I, At Twilight: A play for two actors, three musicians, one dancer, eight masks (and a donkey costume). Once again voiced by Clyde and drawing on a number of lectures made by Simon over the past few years, this richly illustrated presentation investigates both the role of the artist’s talk in Simon’s practice and his continued interest in the relationship between translations, transformations and transpositions. Born in 1967 in Epsom, UK, Simon Starling graduated from the Glasgow School of Art in 1992. He won the Turner Prize in 2005 and was shortlisted for the 2004 Hugo Boss Prize. Currently Simon lives in Copenhagen and was Professor of Fine Arts at the Staedelschule in Frankfurt, between 2003 and 2013. He has exhibited widely including the Bienal de Sao Paulo (2004) and the Busan Biennale (2006) and he represented Scotland at the Venice Biennale in 2003. In recent years Simon has made numerous solo exhibitions including at Villa Arson, Nice, France, Museum fur Gegenwartskunst, Basel, Switzerland, Mass MOCA, North Adams, USA, The Power Plant, Toronto, Canada, The Hiroshima City Museum of Contemporary Art, Tate Britain, London, Staatsgalerie, Stuttgart, MUMA, Melbourne, MCA, Chicago and Nottingham Contemporary, Nottingham. Come and listen to Turner Prize winner Simon Starling. 6 May 2017 The Shoe Factory Social Club, Norwich. Simon Starling in conversation with Anna Milsom, on translation in artistic practice & the importance of artists’ talks.